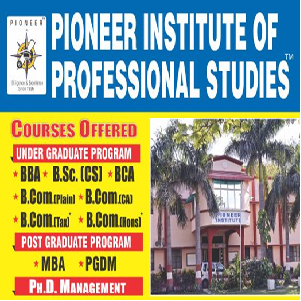 The Four Day Induction Program for UG I Semester students was organized in the Seminar Hall Pioneer Institute. The program was scheduled from July 29th to August 1st 2015. The aim of the program was to give insight about the college, its faculty and staff members, about the culture at campus, rules & regulations, associations, events and different departments. DAY 1: The program started with lightening the lamp of goddess Saraswati by Dr. CA P K Jain, principal, Dr. CA Prashant Jain, Executive director and Dr. Mona Tawar, Director. All faculty members were present in the seminar hall and introduced themselves to students and with the respective departments. Following the sequence staff members introduced themselves and the concerned department. Heads of various departments with their team briefed the students about the guidelines to be followed which include heads of Library department, IT Department, Accounts Department and the Mentors. Dr. CA P K Jain addressed the students and motivated them to perform extraordinarily in the every aspect of life. He emphasized on doing things differently rather doing different things. Dr. CA Prashant Jain shared the importance of student life in the years to follow and explained them to make full use of this life to build a smart career. Dr. Mona Tawar stated the examples of various alumni who have gained from the institute and shared success stories with the students. Mr. Sumit Zokarkar explained students about the online filling of Anti Ragging form and submission of the same to the concerned department. Also a brief guideline related to anti ragging was announced to students and introduction to various committees and cells for student welfare was explained to students. DAY 2: This day started with Yoga instructions, and students performed Surya Namaskar to start the day. They were already being told to be dressed to perform yoga. Post this session student interaction started with informal games and activities. There were many games planned for the new comers which included 1 minute games, couple games and team games. Students enjoyed a lot as they participated and boosted their team to compete others in the activities. DAY 3: This day was a Bollywood day. All students were dressed in various styles of Bollywood actors and actress and movie was being shown to them in the seminar hall itself. Students were told to be preparing for the next day to perform on stage. DAY 4: At last the day came when students had to perform their talent and earn points for their team. A talent hunt show was organized which was judged by panel of judges. Students from all streams BBA, BCA, B. Sc. and B Com participated with full zeal and enthusiasm and showed various talents, mimicry, dance, singing, acting etc. Post this session the total score was added and prize distribution was done. Dr. Mona Tawar distributed gifts to the students.The program was conducted by Mr. Varun Keshari and Mrs. Kumkum S Modak. The induction program for budding managers was organized in the Seminar Hall of Pioneer Institute of Professional Studies, Indore. The program was scheduled on 11th September 2015. The aim of the program was to give insight about the college, its faculty and staff members, about the culture at campus, rules & regulations, associations, events and different departments. The program started with lightening the lamp of goddess Saraswati by Dr. CA P K Jain, principal, Dr. CA Prashant Jain, Executive director and Dr. Mona Tawar, Director. All faculty members were present in the seminar hall and introduced themselves to students and with the respective departments. Following the sequence staff members introduced themselves and the concerned department. Heads of various departments with their team briefed the students about the guidelines to be followed which include heads of Library department, IT Department, Accounts Department and the Mentors. Dr. CA P K Jain addressed the students and motivated them to perform extraordinarily in the every aspect of life. His words reinforced students and boosted their morale. Dr. CA Prashant Jain shared the importance of student life in the years to follow and explained them to make full use of this life to build a smart career. Also he discussed the importance of a positive attitude towards life and the results of hard work. Dr. Mona Tawar stated the examples of various alumni who have gained from the institute and shared success stories with the students. There were many games planned for the new comers which included 1 minute games, couple games and team games. Students enjoyed a lot as they participated and boosted their team to compete others in the activities. The program was conducted by Mr. Varun Keshari and Mrs. Kumkum S Modak.